For adults, one pump dispenses a sufficient amount to completely sanitize hands. For children, reduce the amount as necessary. For most effective bacteria elimination wait for 15 seconds after use before handling herptile, birds or fish. Use of soap and water immediately after using GermGone will deactivate this product and should be avoided or reuse is required. Ingredients: Water and benethonium chloride. 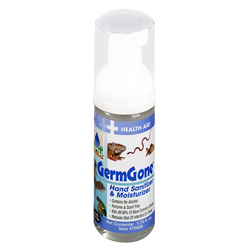 Use GermGone before and after handling any reptile, herptile, bird or fish or for effective, non-drying and alcohol-free sanitation of hands any time. Eliminate the gooey, sticky, odorous conditions common with most other hand sanitizers on the market. Avoid eye contact. In case of contact with eyes, rinse immediately with plenty of water for at least 15 minutes. Do not add to water used for drinking by herps or birds. This product is a hand sanitizer and is not to be used as a disinfectant for cages, water or feed bowls, nor any other objects or devices used in herp, bird or fish keeping.